In order to measure aid organisations (bilateral, multilateral, donors, NGOs) I would like to present my personal quadrants. The quadrants are divided by two axes. On one side I have put qualitative reports and on the other side quantitative reports. 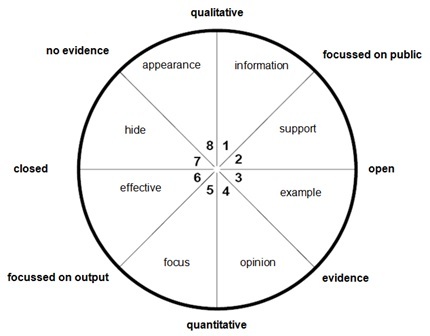 In my opinion; qualitative is the same as to inform and quantitative is the same as to determine. This is also known as a statistical research. Samples are collected and statistics are calculated from the samples so that one can make inferences or extrapolations from the sample to the population. Statisticians ussually work with SPSS. On the other axis I have placed closed and open with each other. Closed means that aid organisations do not inform citizens about the progress of cooperation/assistance. Open means that aid organisations use media as a transport ship to inform citizens. This leads to four quadrants: qualitative-open, open-quantitative, quantitative-closed and closed-qualitative. To get more differentiation in each quadrant, I halved each quadrant by sub-axes. The first is evidence vs no evidence. Evidence lies close to quantitative and open. The second is focussed on public vs focussed on output. Some aid organisations want to look good on the public mass, others prefer to focus on the actual output. Thus, the pizza slices occur. Information: Aid organisation that informs the public. Support: Aid organisation who finds it important to create support. Example: Aid organisation who finds it important to set an example for other aid organisations. Opinion:: Aid organisation that wants to play the public opinion by providing performance data. Focus: Aid organisation with high priority for proven output. Effective: Aid organisation that only wants to prove to himself and to his stakeholders. There is no responsibility outwards. Appearance: Aid organisation that occurs differently than reality. Aid organisations like Doctors Without Borders, UNICEF and WWF regularly put articles on their site. Their object can be placed in the quadrants information and support. I can not find any evidence to confirm the content of these articles. Some aid organisations open a tangle of bureaucracy that need to be solved before receiving poor information. It is a discouragement and a sign of ignorance. Examples are the EU, the Dutch Ministry of Foreign Affairs and Development Cooperation. In my view, Top right is the place for most Dutch aid organisation and Top left for most NGOs in the South. Unfortunately, too few aid organisations can be classified into the bottom left and right areas. In my view, aid organisations and NGOs need to make a shift to the bottom end of the circle. One of the basic principles about Project Management is the concept of the Devil’s Triangle (read more on Wikipedia). 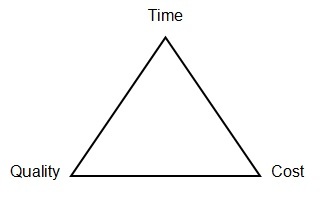 There are three stakeholders on a triangle: time, cost, quality. The basic question you need to ask is: which stakeholder is the most important target in your aid project? Example 1: if one would choose quality for a certain project, you will loose stakeholder cost and time. In other words: it will take more time and financial investment. Example 2: if one would choose quick results (time), the costs will go up and the quality will go down. Example 3: projects with low cost will have lower quality and need more time to process. Depending on the strategy, one can choose a spot in any place in the triangle areas: centered, left-aligned, midway between two corners, et cetera. Choose a far corner, and the other stakeholders will drop rapidly. Right in the middle of the triangle seems like a nice balance, but every stakeholder will partially lose. There are variations on the Devil’s Triangle imaginable, like a devil-square or diamond. The fourth stakeholder could be focus, logistics or risk. If within a project the support strategy is chosen (see quadrants), the importance of PR and creating support within a community becomes very important. The overhead increases. I mentioned Doctors Without Borders, UNICEF and WWF. They write all kinds of news articles, press releases and reports. They share nothing about proven output. I always doubt about their quality. Many aid organisations are master in politics. Of course, this is not wrong. At the political level processes may be fought, but some can not fail to exaggerate. The fourth stakeholder could also be replaced by politics. If we find a white raven: not all ravens are black. This is the basic principle of all science. We have to proof the white raven in a scientific way to invalidate the hypothesis (and make a new one). The culture of aid is a strange culture, rather obstinate. Assumtions are taken for granted in a qualitative way. They make black ravens out of it. This is where it goes wrong. You can say that a hypothesis, which should scientifically be proven, is simply dropped from the air. The main question is: who ever determined that all ravens are black? In other words: who ever determined a certain track record or output? How is this scientifically established? A good example is Hitler’s suicide. ‘His’ burned corpse appears to be of a woman leaving only vague testimony from eyewitnesses who stayed with Hitler until the very last end. These were the most fanatical Nazis, not the most reliable source. So, the determination of the black ravens in this story is not scientific but it will always be part of our history books. Especially in aid culture, this logic is lost. I argue that the inductive logic should be expanded. One should always prove that all ravens are black and not just invent a hypothesis. In that case, Hitler committed no suicide and the authenticity of many development projects becomes visible. In the Netherlands the Freedom of Information Act (Wet Openbaarheid van Bestuur) only applies to governmental organizations, not for non-governmental bodies like donors (read: foundations). Also if a single foundation spend hundred of millions of tax money (like Oxfam Novib, between € 150-200 million annual). In my opinion, all foundations who receive one penny of our tax should open their files to everyone, because tax money is public ownership. Even if they also receive funding by entrepreneurs or individual. The Freedom of Information Act should apply to all governmental bodies, NGOs and donors/foundations to force them to the bottom of the quadrant. It’s to easy for governments to hide behind the structure in which their Extension do not have to be open. This results in narrow reflection. It is susceptible to fraud and it only creates a good news show (slice appearance, information, support). The Dutch government only has a booking relation with foundations. These foundations (donors) only have a booking relation with NGOs in the South. That’s about it. But false receipts and double funding are common…a pitfall. To avoid this, accounting should only be seen as an administrative process, not a means to statistics. An administrative approach is yet another showcase for bureaucracy. Administrative results are hidden from public, while statistics can easily be published. This would mean a total different slice in the above quadrant. I believe, that aid organizations lack a scientific approach and often are unable to explain the origins of their black ravens. One should ask themselves to which pizza slice of the quadrant and to which stakeholder of the Devil’s Triangle he/she belong to. We should ask questions, not only about the white raven but also about the black raven. If we choose wisely, we can change the culture of aid.